UNKNOWN - Provincia di Lorena. 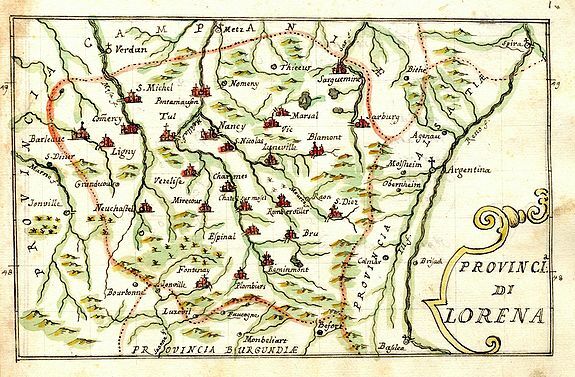 Title : Provincia di Lorena.. Size : 4.7 x 7.4 inches. / 12.0 x 18.8 cm. Finely executed and detailed map by an Italian hand, showing the cities represented by small buildings. Probably a translated copy of a 18th century map. Very decorative, with nice colouring! A true rarity - a one of a kind manuscript map! Condition : Drawn on hand-laid paper. Some light paper thinning to top right corner. Manuscript text to verso. Some uneven toning and soiling - mainly to margins.